Blood supply to the intestine can suddenly be interrupted. Acute mesenteric intestinal ischemia often requires invasive surgery to restore blood supply to the intestine. Early correction of vascular insufficiency is the most important factor in improving patient survival when confronted with acute mesenteric intestinal ischemia. A prolonged loss of blood flow results in irreversible damage to the intestine that can lead to death. It is also imperative that dead segments of the intestines be removed. Several subjective criteria are relied upon to differentiate viable from non-viable tissue, unfortunately, these criteria can lead to an inaccurate assessment. 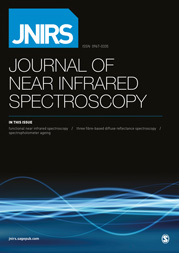 A porcine model of intestinal ischemia was used to determine the efficacy of using near infrared (NIR) spectroscopy to find ischemic segments of the intestine and detect the onset of reperfusion following resolution of vascular occlusion. Nine segments of intestine were identified and six were assigned to three treatment groups; (1) segments undergoing no vascular manipulations, (2) segments undergoing arterial/venous occlusion and (3) segments undergoing arterial/venous occlusion followed by reperfusion. The remaining segments were used as spacers and interposed between each of the ischemia segments. A classification model, using partial least square discriminant analysis, was built on the spectra collected from the segments with no vascular manipulations and the segments that were solely subjected to arterial/venous occlusion. The spectra collected from the intestinal segments that experienced both occlusion and reperfusion were used to test the classification model. The model was able to detect and distinguish ischemic intestinal tissue with a specificity and sensitivity exceeding 80% with an overall classification accuracy of 89%. The method appears to be well suited as an intra-operative assessment method when intestinal ischemia is a concern.